On Monday nights, I rarely have anything to do except watch Anthony Bourdain's show and make dinner for the Princess. So, thanks to the twitterings of Las Vegas Sun reporter John Katsilometes (@johnnykats), I decided to take in an act at the venerable Tropicana Hotel & Casino. I even managed to talk Brother Juan into going with me. 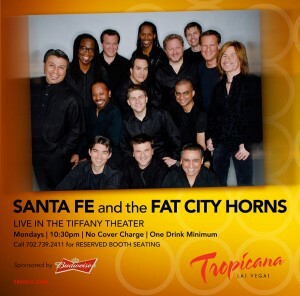 The band is called Santa Fe & The Fat City Horns, an ensemble of experienced pros who can really carry a tune. Santa Fe & The Fat City Horns play a range of musical styles from latin jazz to funk, including some nicely-arranged covers of such hits as The Beatles' "Come Together" and Stevie Wonder's "Livin' For The City." And their original material fits right in with the covers. Brother Juan & I especially enjoyed "Come With Me," a short, danceable number that would play well on adult-contemporary stations. Every aspect of their performance is pitch-perfect and tight, and they interact with the crowd with a well-practiced ease, keeping it all upbeat and up-tempo. If the Princess were with me, we might have shimmied up next to the stage to shake a little tail together. As it was, my feet never stopped tapping, and I clapped enthusiastically after every song. Santa Fe & The Fat City Horns are obviously well-connected. There were numerous distinguished guests in the audience, and band leader Jerry Lopez graciously pointed them out between songs. 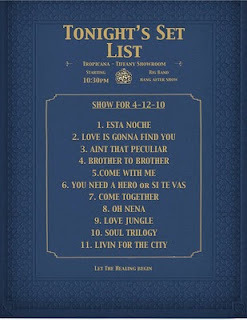 These included a lead performer from the Cirque du Soleil show "Ka," who kept jumping out of his front-row seat to gesture wildly and strike theatrical poses during the show, as well as Ronnie Foster, a keyboardist, producer & arranger for the likes of Stevie Wonder, George Benson, and Human Nature. Mr. Foster even sat in at the keyboard for "Come Together," taking a solo after the trombonist had acquitted himself with a virtuosic riff. After the 90-minute set, we walked out of the Tiffany Theater, only to be regaled by yet more wonderful music, as the Bruce Harper Big Band, an 18-piece horn ensemble, ripped up the open air of the Celebration Lounge. It seems that, although the place is definitely long-in-the-tooth, the Tropicana Hotel & Casino can still be the place to be -- on Monday nights, anyway. Live music, no matter the genre, is always a treat when it's performed at a high level of both virtuosity and passion. And Santa Fe & The Fat City Horns perform at such a high level that it's hard to believe that this was a free show. I've paid lots of money to see far worse. These guys deserve to be more famous. Sorry I missed Monday night ( again! ). I was at the same show. Flat out amazing. Well worth the time spent! I wish they toured to Los Angeles so I could see them again! 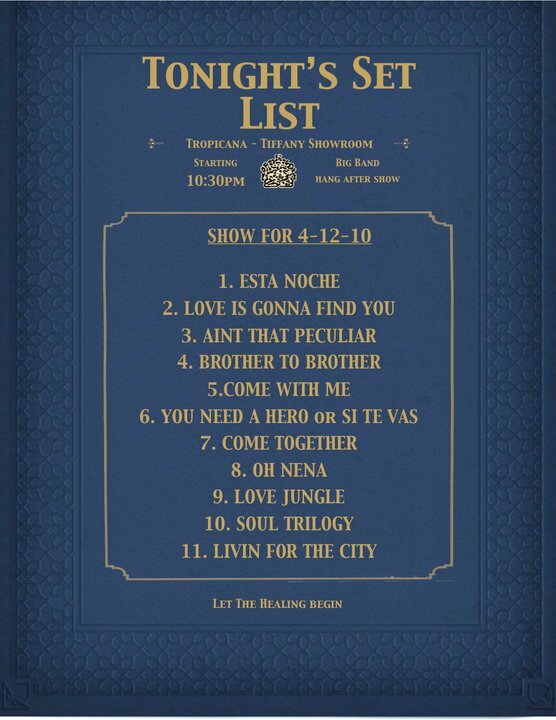 The final performance of their Tropicana residency is tomorrow night - Monday, April 26th.